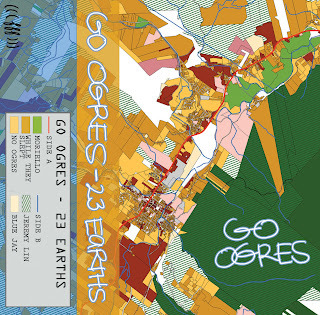 My band Go Ogres recorded a tape! It's 5 songs long, and we're soon to have the copies in our hot little paws. For now, you can give it a listen or download online at www.go-ogres.bandcamp.com! You can even pre-order the tape there if you're feeling it. The art from it comes from a wicked map Angela made, and I did the layout. Superbud Matt Ross (subpixel.bandcamp.com) recorded/mixed/mastered the whole dang thing because he's the best. It was recorded to 6-track cassette. Recommended listen for fans of the village (the sick RPG), Jeremy Lin, breaking into pools, blatant genre confusion, birds, etc. I'll be tabling at the BROKE affordable arts fair in Peterborough, New Hampshire in early June! I'll be selling zines, crystal-inspired handmade jewelry pieces (http://www.youtube.com/watch?v=UBPT1pgByqc), and if I get myself together a little more, hopefully some screenprinted shirts/bags, and cross-stitched wall hangs. That same weekend, Klessa is also playing the Thing in the Spring! It's a whole weekend of amazing shows, events, and hangtime in Peterborough. BROKE is a part of it, as well as film screenings, cereal/cartoon parties, and so much good music. Go check it out, and consider coming to it! Weekend passes are still available and all the acts are way dreamy. I'm pretty dang excited for it. I'm at the finishing line of the new zine! I've screenprinted 2 out of the 3 layers on the covers (the first being a rather tedious grid pattern: causing me to muse on exactly how neurotic I've become as I pull the ink through to each sheet of cardstock), and the guts are close to completion. This stuff always stresses me out in pretty much every single conceivable way, but I guess that's just how it's got to be. Me huddled in the florescent 24-hour copy center cove at midnight, eating snacks, getting papercuts, and cursing at malfunctioning copy machines? Life is glamorous! I went to Toronto this weekend and saw some of the best people in this whole world in what I'm slowly starting to think is my favorite city. It ruled a whole bunch. It didn't really lend to me doing anything specifically "creative" or "productive," but if I can't call "facing off with border guards and winning entry into Canada" productive, then I quit. And, besides.